Following a successful participatory budgeting event £6000 was distributed to Fetlar Community Groups. Voting night for Fetlar was on Saturday 29th July and saw 43 people gathered in the Fetlar Hall to decide which of the 7 projects put forward by local groups would receive funding from £6000 available through ‘Funds for F£tlar’. Funds for F£tlar is the 8th participatory budgeting project run by a community council in Shetland. 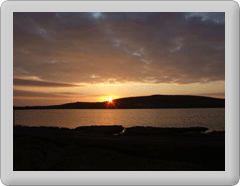 Fetlar Community Council invited local organisations to come forward with projects that benefit their community. The Community Council checked the projects to ensure they met this criteria and put them forward for public vote. The logo for the project was designed by pupils at the Fetlar Primary School. The evening started with delicious fish and chips. Then each project made their own presentation, all passionately read, some with props and photos. The audience cast their votes and settled down to enjoy their 8 o Clocks! Funds for F£tlar received funding from Scottish Government Community Choices and Fetlar Community Council’s Community Development Fund. Fetlar Community Council were supported by SIC Community Planning and Development to deliver Funds for F£tlar.